This afternoon Terry and I headed out for a long ride. Terry had it at 38+ miles. The GMap Pedometer had it about 37. We were out for about 2:15 minutes. We were definitely hauling. My average HR was 157. This week I did 30 minutes running on Monday (Ave HR 144). An hour running on Wednesday (Ave HR 155). 45 Minutes on the stationary bike Thursday (12 miles). Friday I did 1200 Meters in the pool just like the week before. And then 30 minutes running (Ave HR 153). Yesterday I did 30 minutes Jogging (Ave HR 129). 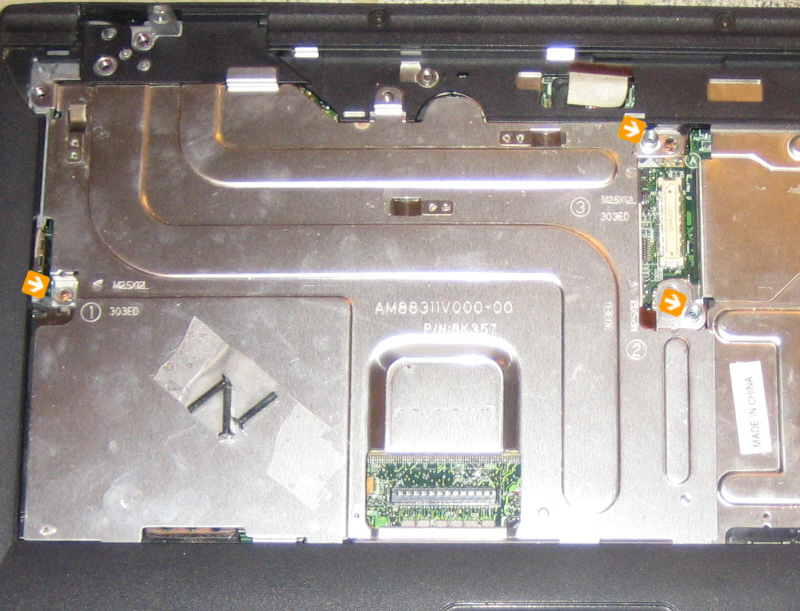 Yesterday I took apart Fran's Dell Inspiron 2650. I took some photos along the way. This article should help ease the pain of anyone else who might attempt such a procedure. Click on any photo to get a larger version. These directions are unconditionally unguarenteed. First things first. You'll need a small Phillips head screwdriver and a small jeweler's screwdriver. You'll also need a 5mm hex socket or wrench. The Phillips is for removing the gazillion screws that hold the freaking thing together. The jeweler's screwdriver is mainly for very carefully disconnecting the various connectors that you will come across. The 5mm is for removing the nuts on the serial port and the parallel port. Also get yourself a half dozen ziplock baggies and a sharpie. The baggies will be for organizing groups of screws as they come out of the machine. The sharpie is to label the baggies - so you'll remember which group is which. You should also get a roll of scotch tape. This is to tape certain screws to the parts that hold together. OK - Ready to start? Now open the display and from the right hand side (see arrow below) use the jeweler's screwdriver to pry up the cover. Carefully. Tape the two screws to the bezel and set that unit aside. 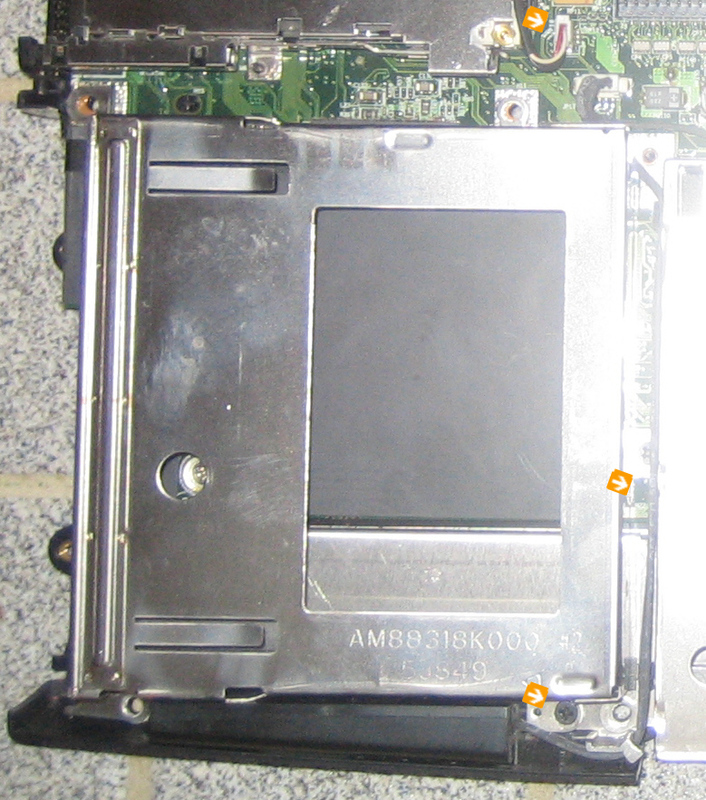 Beneath the cover you will find a small circuit board held on by two screws (see arrows). Remove those two screws and place in a baggy. On the bottom of the circuit board is a ribbon cable. Carefully turn the circuit board away from you so that you can see the connector for the ribbon. Use the jeweler's screw driver to loosen the connector. Be careful! The connector has a lock which you must slide down (toward the cable) to free the cable. Once you have removed the circuit board, place it in a baggy with the two screws and set those aside. Now you should be ready to remove the display. There are eight screws, so get a baggy and mark it "Display". First remove the two screws that hold the video cable to the motherboard and place them in your baggy. Carefully free the cable. Now remove the two screws that anchor the top of the display on the right. And then remove the two screws that anchor the display on the left. Place those four screws in the baggy. 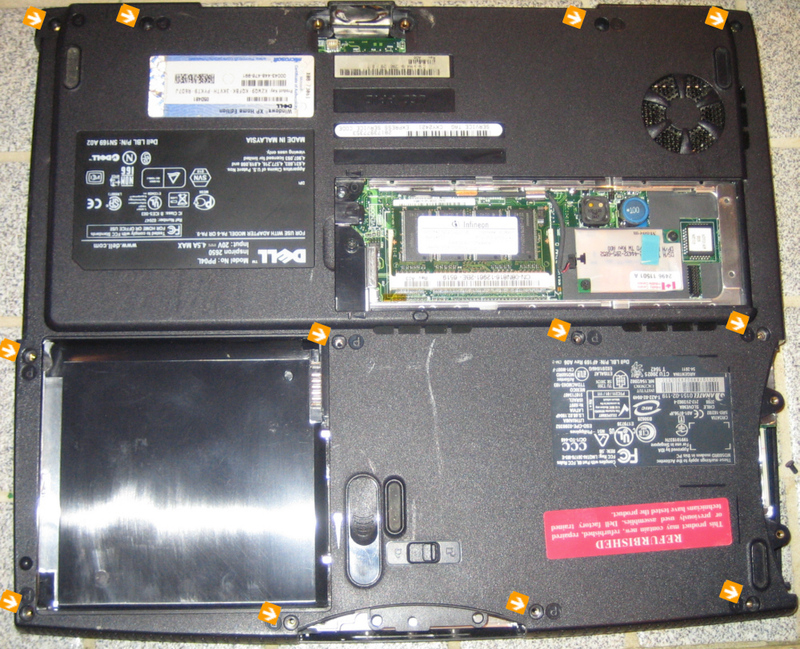 The remaining two screws for the display are on the back of the unit: one on the right, one on the left. Remove those two screws and place them in your "Display" baggy. Now carefully lift the display from the unit and set aside. Next remove the right hand shroud. There are three screws marked in the photo below. These are LONG screws; you don't want to loose them! So tape them to the shroud as shown. Lift the shroud out of the way and set it aside. You are done working on the top of the unit for now, so flip that sucker over and let's attack the bottom. First remove the floppy. 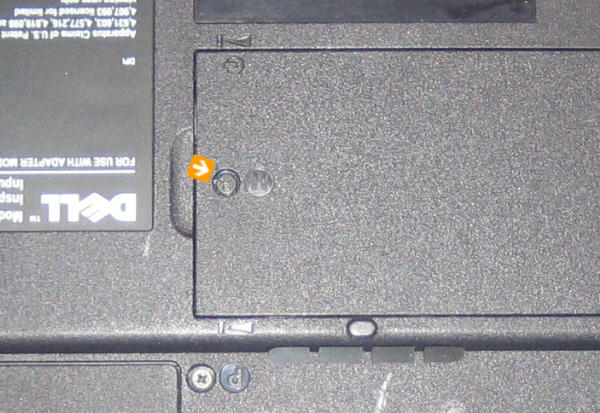 Remove the two screws (marked below) and place them in a baggy marked "Floppy". Slowly slide the floppy drive out of the chassis. Remove the ribbon cable. This is the same type of connector as we saw earlier. I have marked the points on the connector which should allow you to unlock the cable. Slide the marked portion toward the cable - (ie in the same direction that you are moving the floppy drive. ) Once the cable is freed, then carefully pull out the floppy drive and set it aside with its screws. Now remove the single screw at the front center. This holds the hard drive. Once the screw is free, you'll need to slide the bezel on the front of the unit up (toward the bottom of the chassis, which I assume you have facing upward right about now). Got That? Then you can pull the drive out of the chassis. Screw your screw back into the door for safekeeping. Remove the two screws that holds the graphics processor fan. Place them in a baggy along with the cover. Carefully unplug the power cable for the fan. Now lift the fan out of the chassis and place it in the baggy and set it aside. Remove the single screw that holds the memory door in place. Slide the door away, and replace the screw in its hole. Remove the battery and set that aside. 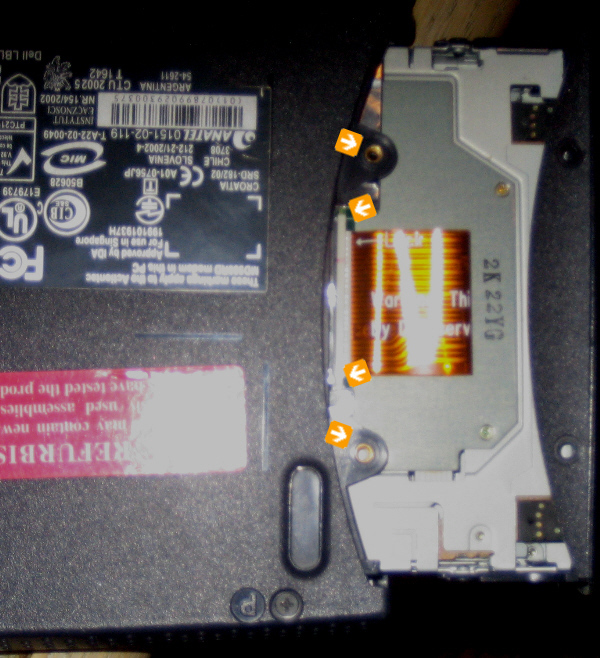 Inside the memory bay, is a screw that secures the optical drive (CD-ROM, DVD, whatever...). 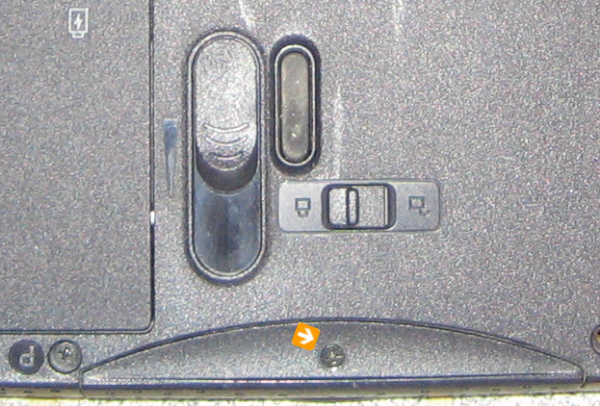 Remove that screw (marked below) and press on the handle (marked) to push the drive out of the chassis. While you are at it, remove the cable for the modem (marked). Use your jeweler's screwdriver to gently pry it away from the unit. Get a baggy and mark it "bottom". Unscrew 12, yeah 12 screws (marked) and seal them up in the baggy and set them aside. Flip the computer back over. There are two screws on the top of the case (marked). Remove these and place in a baggy marked "Top" and set them aside. Remove the cable bundle marked on the bottom of the photo. 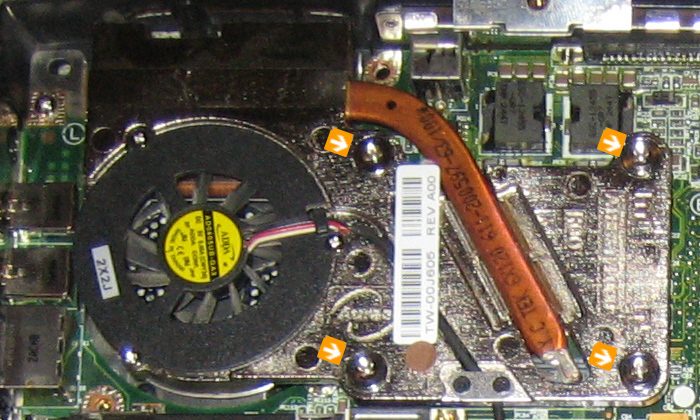 Remove the screw (marked below) which holds the graphics card in place. Place that in an unmarked baggy. You'll need to pop the graphics adapter out; gently wiggle it until it comes out. Then place it in the baggy with its screw and set it aside. Now the top bezel should come right off. 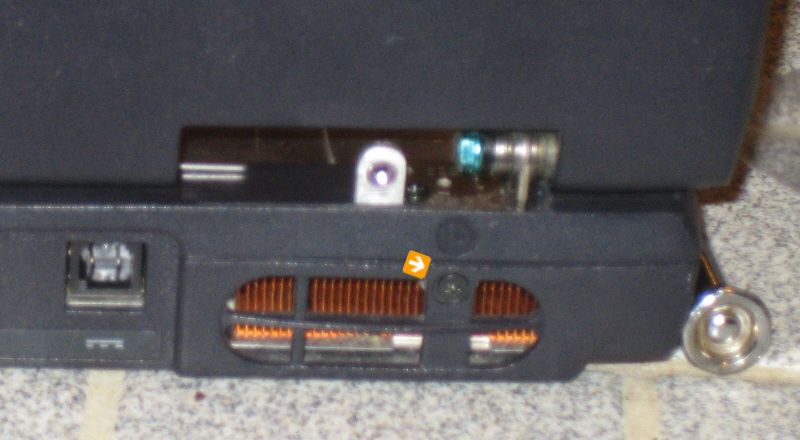 Remove the speaker cable (marked at the top of the image). Now its time to remove the floppy cage. Remove the two marked screws and tape them to the cage. Remove the cage and set it aside. 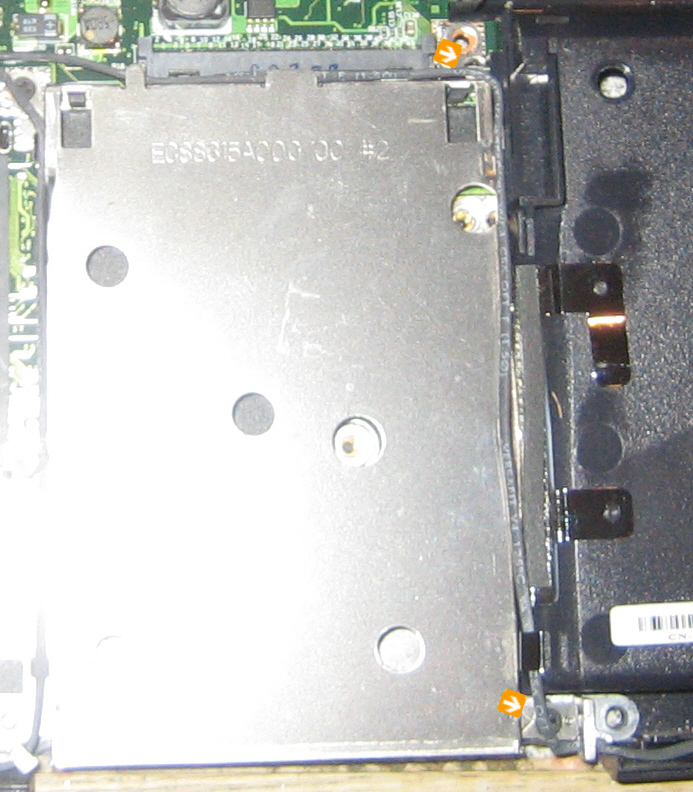 Same song, different verse; remove the two marked screws that hold the Hard Drive Cage to the motherboard. Tape the screws to the cage. Both speaker wires are wrapped under the chassis and then they are run along the Hard Drive Cage. Carefully remove the speakers and free the wire off of the chassis on both sides. Then lift the cage and the speakers off of the mother board and set aside. 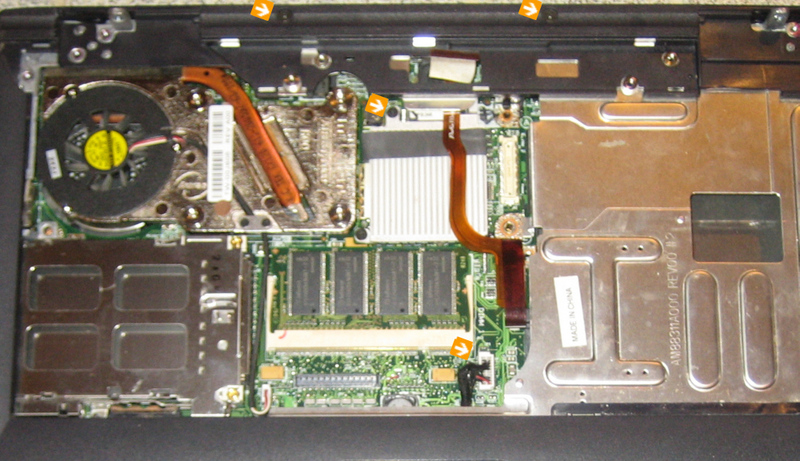 Remove the four marked screws that hold the CPU fan in place. Lift the fan and set it aside. Home stretch! There are five screws that hold the motherboard to the bottom bezel. I don't have a photo without the CPU Fan - but one of the five screws lives just under the CPU fan. Remove these screws and place in a baggy marked "MB". From the back remove the four bolts - two on the parallel port, two on the serial port. Place these bolts in the "MB" Baggy. On the left side, there are two ports for audio. There is small plastic doohicky that you can lift out of place and stick that in the MB bag. There is another plastic doohicky that lives on the upper left corner of the battery bay. Stick that one in the "MB" baggy too. You'll need to work the flashing over the audio connectors. Congrats, you should now be able to lift the Motherboard off of the bottom bezel! At this point you should treat yourself to a fine Malted Beverage of your choice. 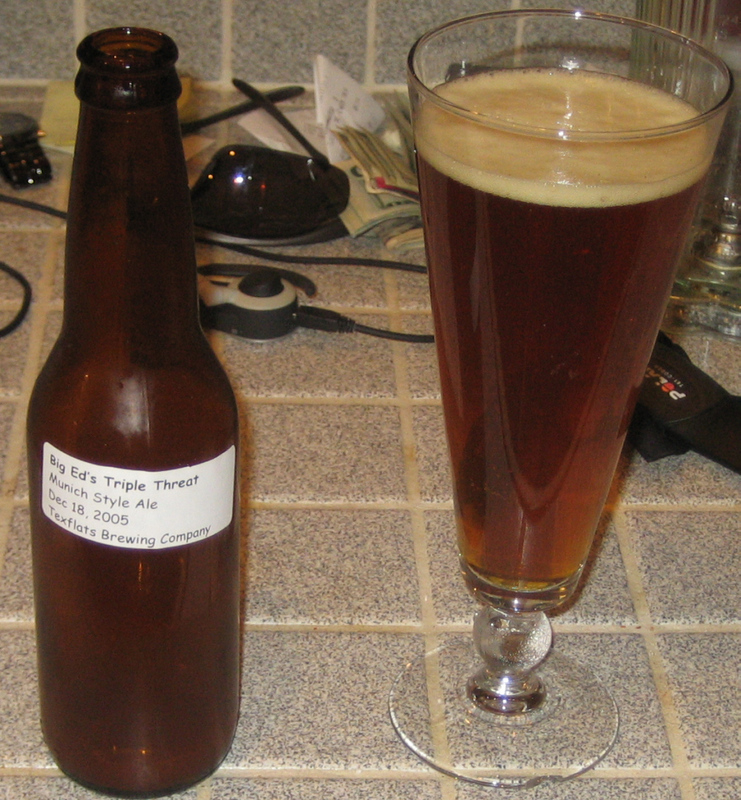 I recommend a Big Ed's Triple Threat Munich Style Ale. Assembly is the reverse procedure, of course! For the first time since Halloween! About time! One of the original items on my Honey-Do list was to "Fix The Stupid Plug on Fran's Laptop". If you were following closely you will have noticed how I skillfully avoided working on this item, while substituting new items into the original list and then working on those new items instead. The problem with her computer was that the power plug was no longer transferring juice to the computer. I've seen this problem before on other laptops. Usually the plug is cracked or it has simply worked itself off of the motherboard (broken soldier joints.) It was the later scenario which I suspected for Fran's computer. 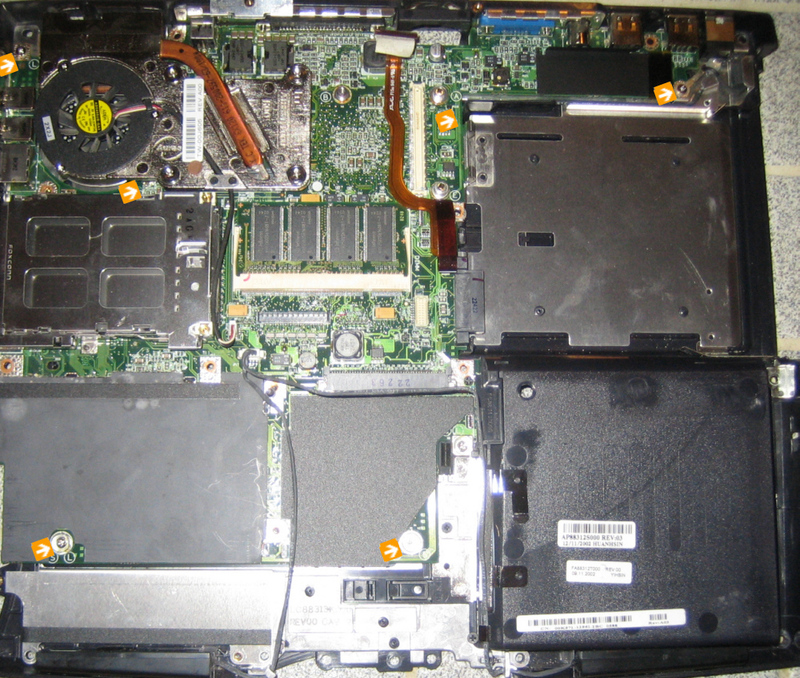 Fixing this problem requires complete disassembly of the laptop to extract the motherboard. Then soldiering the existing or new connector. Then reassembly. For those who have never taken apart a laptop computer, let me just say that it is not for the faint of heart. There are a gazillion little tiny screws, and lots of strange connectors, most of them teeny tiny small. And there are far more parts than you would ever imagine. So this was not a job I was excited about doing. Plus we have four other laptops scattered about the house; its not like she was kicked off line or anything. But, Fran wanted HER computer back in operation. So yesterday I fixed that sucker. Sheesh. Yesterday I hit the pool at the club. I figured that I would attempt Tuesday's workout. I started with 100 Crawl, then did 18x50 Crawl with 30-35 seconds rest, then 200 back. 1200 Meters! Nice. Yesterday, I did an hour on the stationary bike at the gym. 19.87 Miles. Spinning between 100 and 120. Today I did a nice run from the gym in just under an hour. This was a new route that I had never run and it had some surprising hills! So I rode the bike on Sunday, and I ran yesterday, so I headed to the pool today at lunch. My plan was to do last Fridays workout a bit quicker. I started with 100 Meters Free, then 35 seconds rest. Then 6x50 Free with 35 seconds rest. Then 100 Back stroke. Then 8x50 Free. Then 100 Back. And 50 kickboard for good measure. 1050 meters in 30 minutes. MUCH better than Friday. I was hitting the 50s in 45 and kept to 35 seconds rest. Felt Great. Except for my eyes. Mental note: Get some freaking goggles. And I dont mean news magazines. Tonight I did 60 minutes out at the Sting complex, during Logan's soccer practice. Last week one of the other dads joined me for 20 minutes. Today he hung on for 26 minutes. I also squeezed in 4x 100 strides. I was able to pick up the pace for the last 15 minutes without trashing my HR. It was a nice workout! So the plan was to ride down to the bike shop on Saturday, get fitted to the bike, and ride home. But the tires seemed a bit soft. So I tried to pump them up. But they have some kinda weird valve that did not match anything I had in my garage. My futile efforts to sort this problem out, only resulted in further loss of air from the tire. New plan. Toss the bike into the back of the truck and drive to the bike shop. Kelly put me on the bike, adjusted the seat, and proclaimed me fitted. She taught me to snap in my boots to the pedals and she told me that I would fall over once or twice and not to worry, but to try to remember to snap out of the pedal before stopping. Kelley sold me a pump so that I could put air in the tires with the weird valves. Back home I took the bike for a spin around the neighborhood. No problem. I even remembered to snap out of the clips. Until I got home that is. I rode right up the front walk. Stopped. Fell over. Sheesh. How embarrassing. Then Marissa got out her uncool bike and we went to the park. We rode around for about an hour and came home. Sunday Morning. O-Dark-Thirty. The Freaking Cat pounces over Fran and attacks me. What the heck? She had never done anything like that before. Fran sez, "what did you do to the cat?" Nothin! Honest. Anyway it was time to get up and meet Terry for the ride. I pushed the bike out the door. Snapped in and fell over into the bushes. Sheesh. It was 15 minutes before Terry was due to show up, but I figured I better do a lap around the neighborhood to make sure I was dressed ok. I took a right into the hood and there was a bike approaching. Perfect Timing. So Terry and I logged about 24 miles in 100 minutes. I survived. Hopefully not slowing down Terry too much. And certainly the longest aerobic workout I've done since April! So I am now officially on my way into this weird new world of the bike. If I can just remember to snap out of my clips, I might even survive! Today I went to the pool, which I verified is 25 meters, and knocked out 1000 meters in 45 minutes. Update: 100 free, 2x50 Free, 2x50 back, 4x50 Free, 2x50 back, 4x50 Free, 2x50 back, 25 Free, 3x75 kickboard. Yesterday, I did 40 minutes of jogging over at Sting. Wednesday, I did 45 minutes on the bike at the club. Tuesday was an off day. Monday I did 45 minutes of jogging at Sting. Tomorrow, I am going to take the new bike to back to the shop to be fitted on it - not sure what the hell that means. But I do know I gotta buy some clips and shoes - so I will definitely fit those on there. The bike shop is probably 7 miles from home. So I'll ride there and back. That will be my tune up ride. Then Sunday, Terry is coming over and I'll have my first official ride with him. Marissa is half way through fifth grade; Logan is halfway though second grade and Reagan is halfway through kindergarten. Until yesterday, not a one of them had ever missed a day of school. That was 8 and a half kid years of school without absence!! Last week Logan had a virus that knocked her out of action for two days - but there was no school! Sunday it hammered Reagan, so she missed yesterday and today. If Marissa finishes the year without absence she will have completed Elementary School without any absences ever. Pretty amazing streak. In June it became apparent that my hip was seriously screwed up requiring that I stop running. From July through October I did physical therapy to get my hip working better. My hip is now mechanically OK, but I still have a bunch of hip pain. For the first two months of PT I was not making good progress. Then my therapist put me on the bike. Pain went away, any my hip stability improved! Saturday Marissa and I went to the rent house to fill in the hole from repairing the Evil Blue Pipe. Marissa had brought her bike to ride around the block in case she got bored. On the way home Marissa told me that she wanted a new bike, something cooler than the ride she has. Cool apparently means Blue rather than Purple - at least as much as I could tell. Marissa also wanted me to get a bike so that I could ride with her. One my running buddies, Terry, has long recommended Plano Cycle and Terry's Daughter works there. So that's where Marissa and I went. I rode a Specialized Allez and a Cannondale R800. Now I can't claim to know jack about bikes, but the Cannondale was clearly the smoother ride. So I called Fran. She basically shot the idea down. When I got home she told me that I should buy a bike for $100 from Walmart. Hmmmmm. Clearly I had done a poor job selling this idea. Sunday Marissa rode her uncool bike with me while I ran 55 minutes. Today I headed to Walmart at lunch. Well needless to say I did not find much to work with. Sigh. After work I got into my running gear and headed out to the Sting Complex to pick up Logan. I ran 45 minutes at the facility while waiting for Logan. Needless to say, I am currently in a state of shock. Terry - It's time to ride! Fran was up early and took Marissa to soccer practice. I installed a 6 degreetrigger wheel on the bike. The trigger wheel advances the ignition to 6 degrees before TDC. Of course that meant another test ride. And of course that meant test rides for each of the girls too. I got the last speaker installed in Fran's truck. I took Logan to her soccer practice - on the bike. It was her test ride! While she was practicing I did 30 minutes of jogging. Tomorrow its back to the grind. * Fix the garage door: Phase A, Phase B. * Get kicked off the company ski team. * Get my January ride on the bike locked in. * Install the trigger wheel on the bike. Last night Fran and I went to the Stars Game. The Stars were horrific. However, in the third period Modano scored two power play goals to get them back in the game. We rode the Dart Train down to the AAC which was cool. We also had a nice meal at Pappadeaux before the game. Today I put the Handlebar Helmet Locks on the bike. Of course I took the bike for a test ride - which locks me in for my January ride. Then the kids all wanted rides, so I took each of them out for a long ride too! It's my policy to make sure to ride the bike at least once each month. It can be tricky finding a nice day in Dec, Jan and Feb! Two more speakers are in Fran's Truck. Marissa and I thought we saw some Martins yesterday. We are several weeks early - but who knows what with the warm weather and all. So Marissa and I cleaned out the Martin House and put it into position. So its not a surprise that the Skins are wearing White at Philly as Philly always wears the green at home. However, the Skins are continuing to wear the goofy white pants with the white tops. So they have worn these uniforms now five weeks in a row. And they have four wins coming into today with the white over white. PS: There is no worse torture for Redskins fans than listening to that idiot, Troy Aikman.